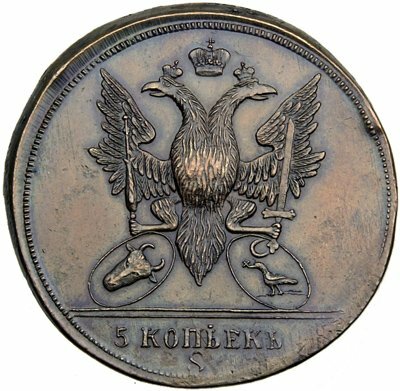 The pictures of the novodel coin above are present on Romanian coins through the kind permission of "Ira & Larry Goldberg Coins & Collectibles, Inc.". Two types of Sadagura coin patterns were restruck as novodels - the one of 3 dengas and the one of 5 kopecks. The grand duke George Michailovich (1863–1919) wrote in 1894 that the dies of the two novodels were taken by himself from the mint of Yekaterinburg. He showed that these restrikes, gross copies of the originals, did not have the edge "pressed on the machine", and as a result the pieces presented a flat edge. Some novodels exist with the edge adorned with various models, but the edge was adorned by hand. 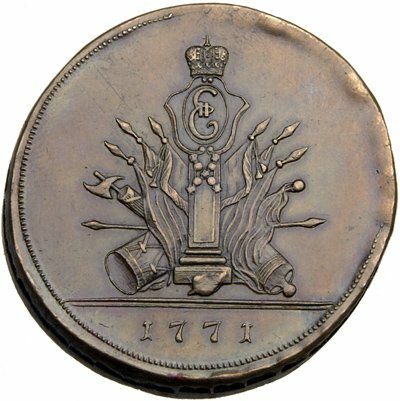 The novodels can be distinguish quite easily from the original coins by design. They have also larger diameters (1-2 mm larger) than the genuine coins. - Reverse: the broad strip representing the ground is missing; the exergue is separated from the field by two horizontal thin lines. 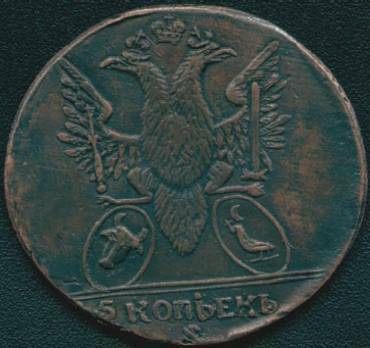 Nowadays there are several types of novodel coins, but struck into the contemporary period. 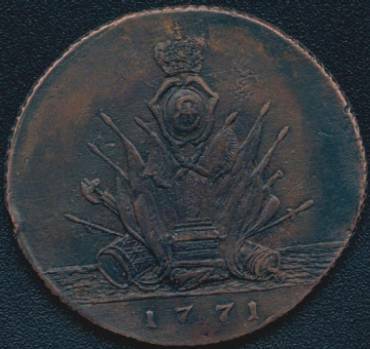 Such a novodel is presented below through the kind contribution of Mr. Mircea Jar, and differ from the novodel presented in Monede şi bancnote româneşti, the most obvious difference being the absence of the outer adorned circle. The edge is hatched, with dots inside the rhombi. It reproduces a face of the 5 kopecks Yekaterinburg novodel and a face of the Sadagura pattern.